Personal Edition lets you manage WhatsApp chat history for up to 3 different Android Devices for the price of one. Only download and install on 1 Mac computer. Family Edition lets you download and install on 2 Mac computers of your family and manage WhatsApp chat history for up to 8 different Android Devices in your family for the price of one. A specially priced, benefit-rich bundle created for business professionals. 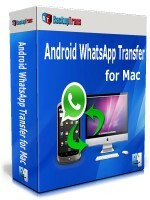 It is a one-year license that lets you download and install on 5 of your company's Mac computers and manage WhatsApp chat history for unlimited Android Devices for the price of one.